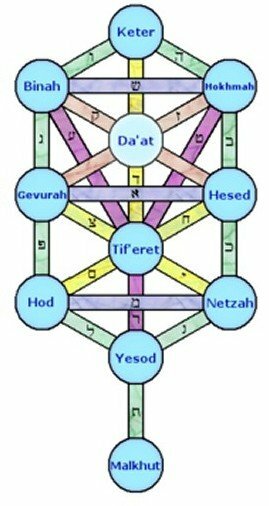 “The Golden Dawn was a magical secret society, a crowning glory of the occult revival which flourished at the end of the 19th century and taught a unique blend of Jewish mysticism (called Cabbala or Kabbalah, also to be found in Bowie’s symbolism), astral travel, magic, yoga (also practiced by Bowie) and how to communicate with angels and demons. 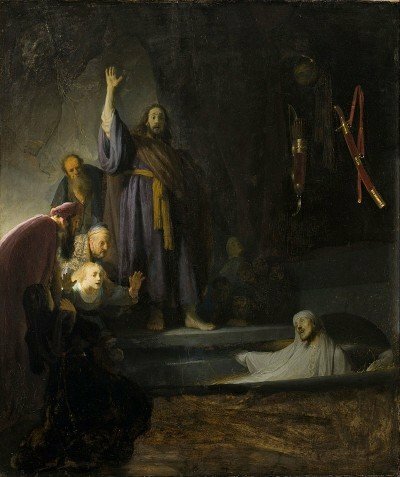 For this latter communion it was first necessary to empty the mind, to make room for the unknown to enter – something that bears a strong resemblance to Bowie’s ‘cut-up’ method of writing lyrics”. – Ibid. 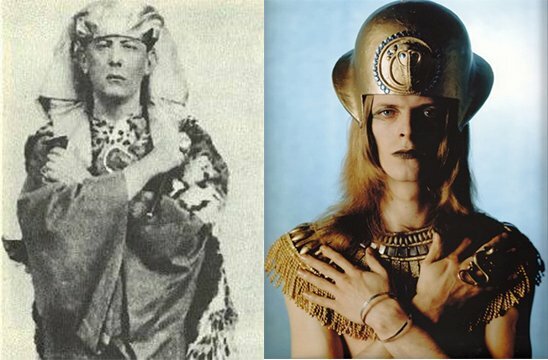 Aleister Crowley (left) and David Bowie (right) in the inner-sleeve of the CD version of Space Oddity. 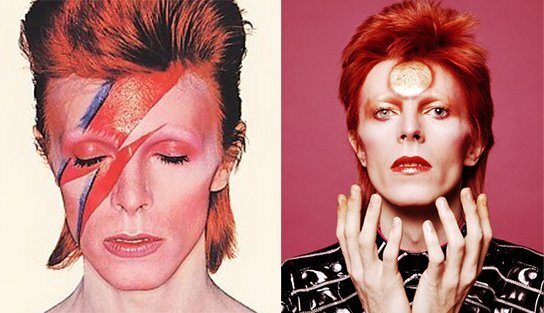 The two forms of Ziggy Stardust. Left emphasizes the one-eye sign (from the album Alladin Sane) and the other emphasizes the pineal gland, aka the third eye (fromThe Rise and Fall of Ziggy Stardust and the Spiders from Mars). In Bowie’s visionary performance, civilization was going to collapse and the ‘Infinites’ would arrive. Ziggy Stardust was to announce the coming of these ‘starmen’ bringing hope. Ziggy is their prophet, the messiah who takes himself to incredible spiritual heights, and is kept alive by the devotion of his disciples. When the Starmen finally arrive, they take bits and pieces of Ziggy so they can manifest themselves as real physical beings. Eventually they tear him to pieces on stage during the performance of the song ‘Rock’n’Roll Suicide’. At the moment of Ziggy’s death, the Starmen take on his essence, and become visible. – Ibid. 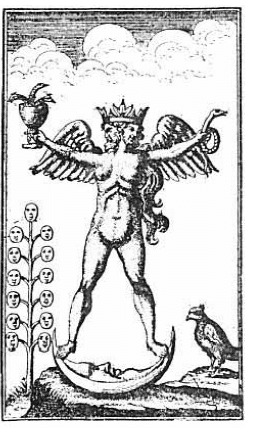 This symbol from the Turbæ Philosophorum (1750) represents a hermaphroditic figure as the accomplishment of the magnum opus. The active and passive principles of Nature were often depicted by male and female figures, and when these two principles were harmoniously conjoined in any one nature or body it was customary to symbolize this state of perfect equilibrium by the composite figure above shown. If you follow the path described by Bowie above, Keter to Malkhut describes the descent from Godhead to the physical realm. The theme of “descent from the heavens” has always been at the core of Bowie’s work. 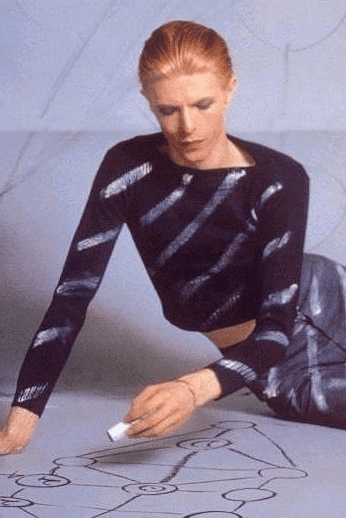 Bowie drawing the Kabbalistic tree of life. The video begins with a dead astronaut on a remote planet. The jewel-encrusted skull represents the astronaut’s ascension into godhood. A “grand priestess” holds the skull between two rows of women who cannot help trembling in its presence. On one hand, the women “assume the position”. On the other, three crucified scarecrows (who appear to be animated by an unholy force), move their hips in a suggestive manner. The “blind follower” with buttons instead of eyes. This character represents the simple, ignorant man. The preacher propagating the “Book of Blackstar” – with dumbfounded followers behind him. The “flamboyant trickster” who appears to have taken over Bowie’s aging body with eccentric mannerisms. 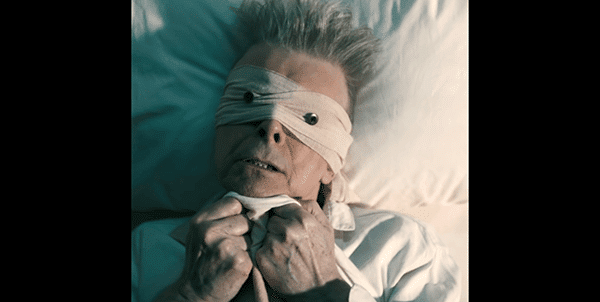 In the role of the “blind man” Bowie is an aging human who is physically weak, laying on his deathbed and scared of things to come. 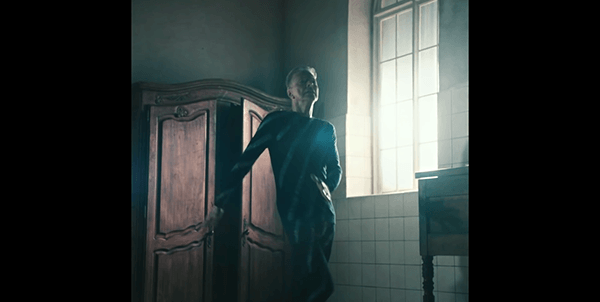 This Bowie is not dying – he even treats himself to few dance moves. 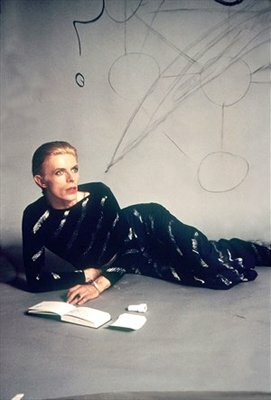 Bowie wears the same outfit as seen on the cover of “Station to Station” in which he is drawing the Kabbalistic Tree of Life. 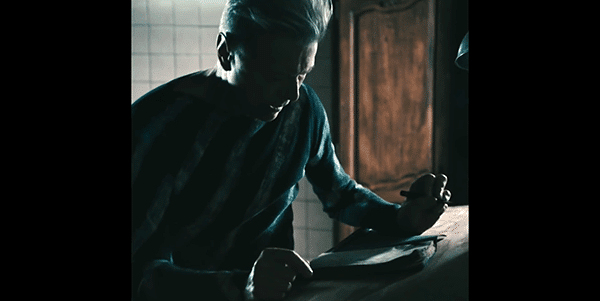 With theatrical mannerisms, this Bowie writes feverishly, as if animated by a higher force. Is this the source of Bowie’s inspiration throughout the years? 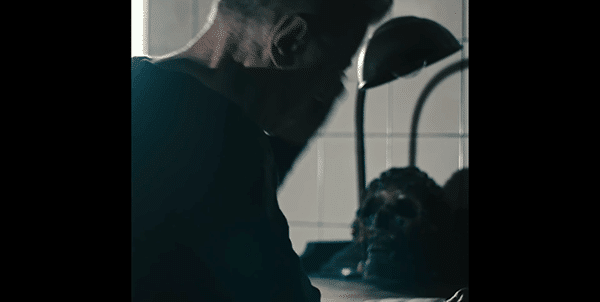 At one point we see the skull from Blackstar, implying that this Bowie possesses that secret occult knowledge. 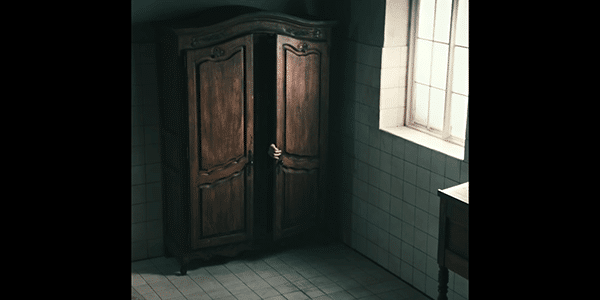 The video ends with occult Bowie retreating back to the dresser and closing the door. His final album, Blackstar is a direct continuation of the “Bowie mythos”. 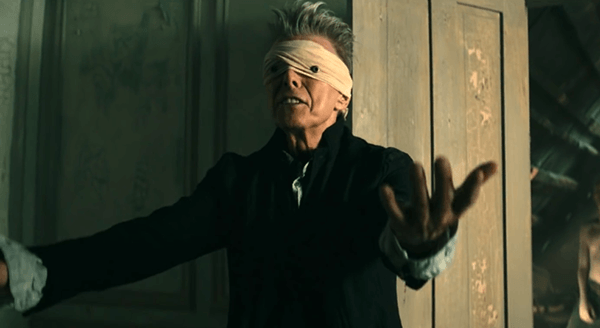 Meticulously planned to turn his death into a work of art, the imagery of Blackstarties together several iconic moments of Bowie’s career into one final narrative, one that confirms the extreme importance of occultism in his work.